Right now the rover ants seem to be all about pupae. there were ants moving pupae to the right. And ants moving pupae to the left. These were all on the same trail. Sometimes the two groups actually bumped into each other from opposite directions. Do you have any idea what they might have been doing? 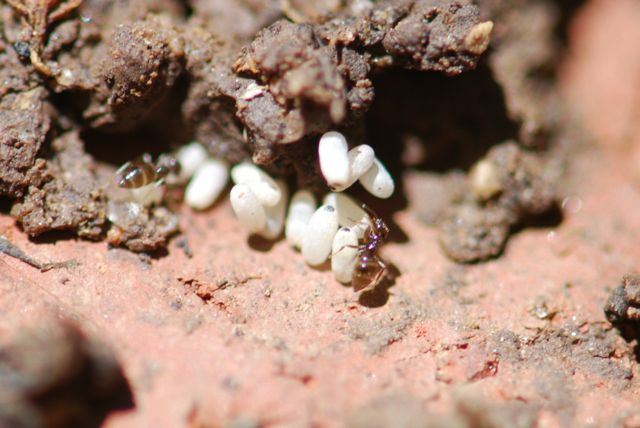 Might it not be, that individuals of the nest have found a new nest site and whilst they are convinced and busy carrying pupae to that site at the same time there are “reactionary” ants stubbornly carrying pupae back to the nest, which is where they “think” they belong. But on the other side it might as well just be a way of heating the pupae for a while and then carrying them back into the nest – good for the pupae and good for the too cool nest. Perhaps. And, just by the way, thankyou so much for this beautiful site. It gives me all I want after a long day’s work. I like your idea that it was a temporary outing for the pupae. The spot was in the sun. any idea how old the colony was? 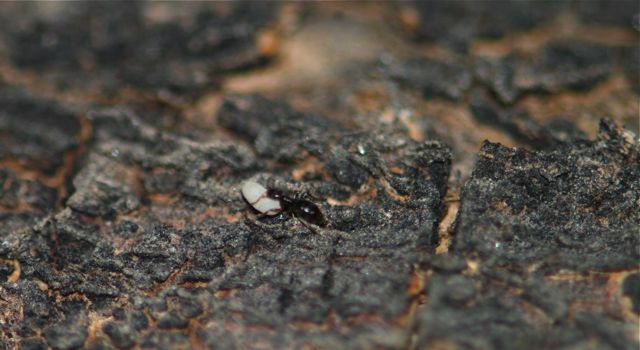 Reciprocal brood raiding like you observed occurs in young Solenopsis invicta fire ant colonies. Unfortunately I don’t have any information about how old the colonies were, although some of the workers were fairly light colored. The thought had crossed my mind that the behavior was similar. It would be interesting because the two species originated in a similar region of South America, as far as I know. I guess my next step is to do some marking ants and mapping colonies? I’m going to be taking AP Biology this summer and I needed to observe animals over the summer. I decided to start my own ant colony and I found an ant nest in my back yard. They look like rover ants, but they are not as dark. Actually, they look more like Argentine ants, but they have the behavior of rover ants. Their abdomen is a sort of gleaming brown ( I live in GA if that helps identify them). They were found at the base of a decaying stump of a tree. On the surface, there was barely any evidence of their dwelling. I took about 30 worker ants and seven virgin queens that still had their wings on. I also took three males and about 15 pupae. One male and two virgin queens have died. Some of the pupae have hatched, there are really pale ants which i assume are the newly hatched ones. I have been feeding them honey every five days, and they are in a jar. The soil is the same as the one that I found them in. 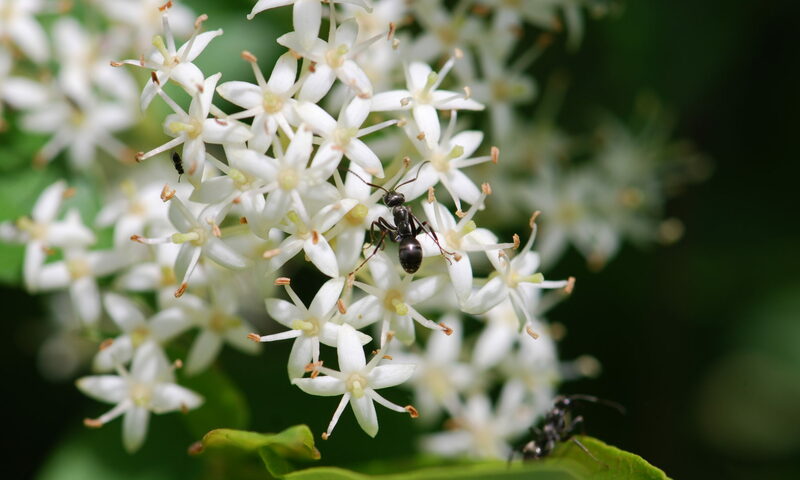 I have found that they do exactly what you said up there, they move the pupae back and forth, some ants bringing while others are taking them all at the same time. They also switch the chamber that they keep the pupae in quite often. The queens all stay huddled in one chamber near the surface, though one ( not sure if it is always the same one) keeps close to the pupae. They are harmless, when I picked them off the ground, they did not sting or bite. I have refused on smashing one of them to see what they smell like, as it would be counter-productive to my efforts to keep them alive. They are a little over one-eighth of an inch. The males are slightly bigger than this, and the queens are perhaps three times as large. The holes that I poked on the jar are evidently too large, and I have found that some of them have been getting out. On more than one occasion, I have observed one of them finding its way back inside the jar. It is for this reason that I have kept the jar in the same place. I would like to know if you think that these ants will survive as a colony. I have had them for about three weeks. I go back to school on Monday, so the assignment will be due sometime next week. However, I would like to keep them afterwards, as I really do find them fascinating. Also, could you perhaps offer some advise as to how to raise them? All help and comments will be gladly appreciated. Sorry for the slow reply. You have a lot of questions, and I’m not sure I can answer them all here. 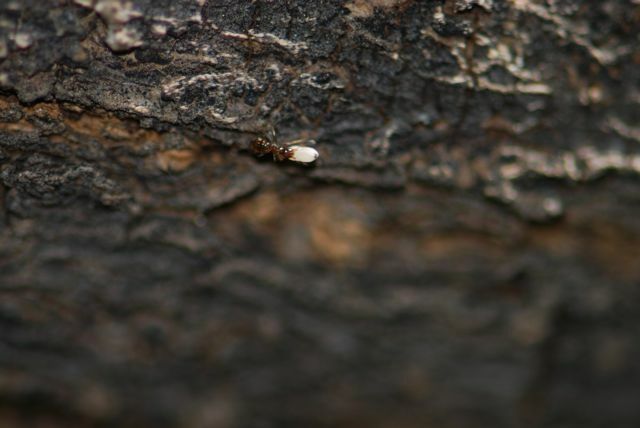 First of all, I recommend that you try some of the forums listed on my resources page: http://blog.wildaboutants.com/ant-related-websites-forums-and-blogs/ They are a wealth of information about raising ants and have experienced people to answer questions. If one of the ants dies, and you have access to a good microscope, you can tell if it is a rover ant by counting the antennal segments. Rover ants (Brachymyrmex) have 9-segmented antennae, which is a unique characteristic among the ants.